First off, let me just start by saying a massive thank you, I just got 100 WordPress followers. To show my thanks, I have something quite special coming out very soon that I have worked really hard on. You guys are going to love it. Now, without further or do, on to the recipe. You know why you clicked on this post, you know what’s coming. Halloween is just around the corner, and I don’t know about you but I am super excited about it. 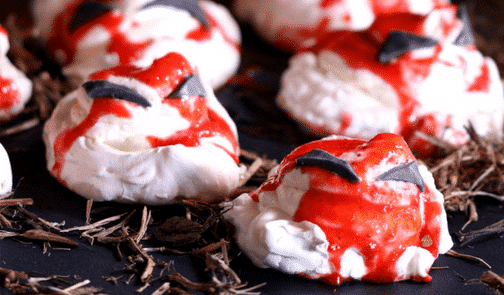 We Australians love celebrating Halloween and I have seen many other awesome creative recipes out there. Which in turn inspired me to not let it go unnoticed on Blogtastic Food. 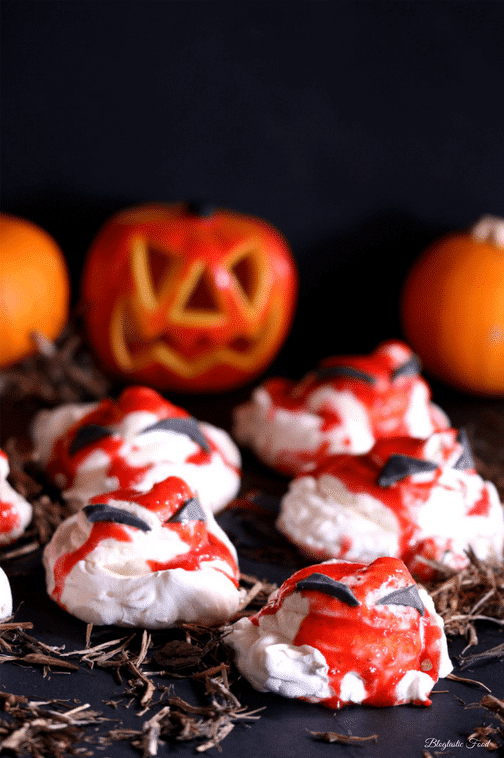 So I have made these mini Halloween Pavlovas. Now I wanted to make a recipe that obviously suited the theme, but at the same time is simple enough to do. Oh, and I definitely didn’t want to make a recipe involving pumpkin. Why? Well, let’s be honest, it’s not like there isn’t a huge amount of pumpkin recipes for Halloween out there and I think it is important not only to make good content for these special occasions, but I also want to make sure I give my content some originality. 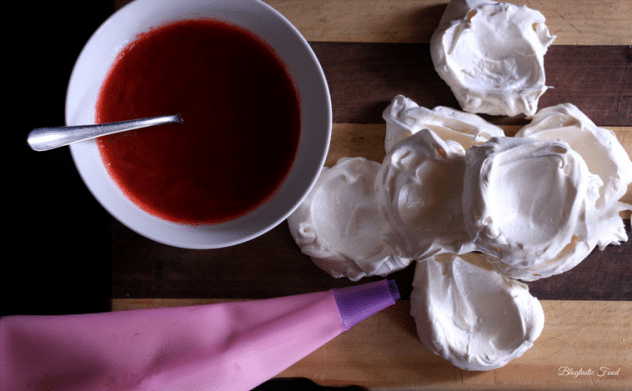 This post is actually inspired by my “how to make meringues” post which I will link at the bottom of the page in case you want to check that out. A while ago I attempted to make mini pavlovas for the blog and I wasn’t satisfied. 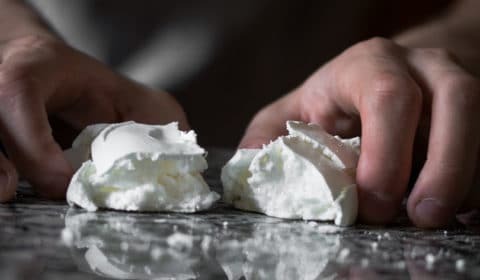 One because the meringues didn’t work, and they would just go soft and wilt down, which was something I always struggled with meringues until recently. Also, the dessert too sweet. This is actually something I always try to be wary of especially when it comes to desserts. I am all for making a festive dessert really cool and epic etc. However, something I will mention is trying to be aware of how much sugar is going in each element of the dish. In this case, the meringue is already very sweet. So you don’t have to worry about anything else being super sugary. The cream adds a nice lightness and the strawberry coulis is just a nice fruity and acidic touch, so you get a nice balance. Guys I really wish a super special Halloween, and that if you do choose to make this recipe, I hope that serves you well. 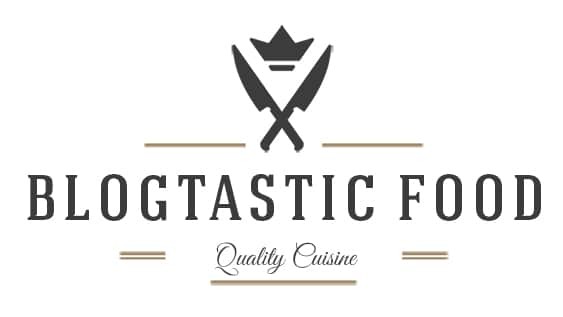 If you don’t want to miss out on any upcoming posts or recipes, feel free to subscribe. You can also follow my social media. Crunchy and gooey pavlovas topped with raspberry coulis for Halloween. Add your egg white and a pinch of salt to a large, clean bowl. Use an electric beater or whisk to beat the egg white to soft peaks, meaning that the peaks should still curl down when you lift up the whisk/electric beater. Gradually add your sugar while beating to stiff peaks. You want the mixture to be smooth, glossy and you want all of the sugar to dissolve. You can rub some of the mixtures between your thumb and finger. If you feel any sugar granules then keep on beating. Spoon nice big rustic blobs of meringue on your lined baking tray, then use the back of the spoon to push the middle of the meringue blobs inward to make mini meringue moulds (just look at the first photo if you don't understand). Bake in the oven for about 50-60 minutes. When you take the meringues out of the oven, let them cool for about 5-10 minutes. 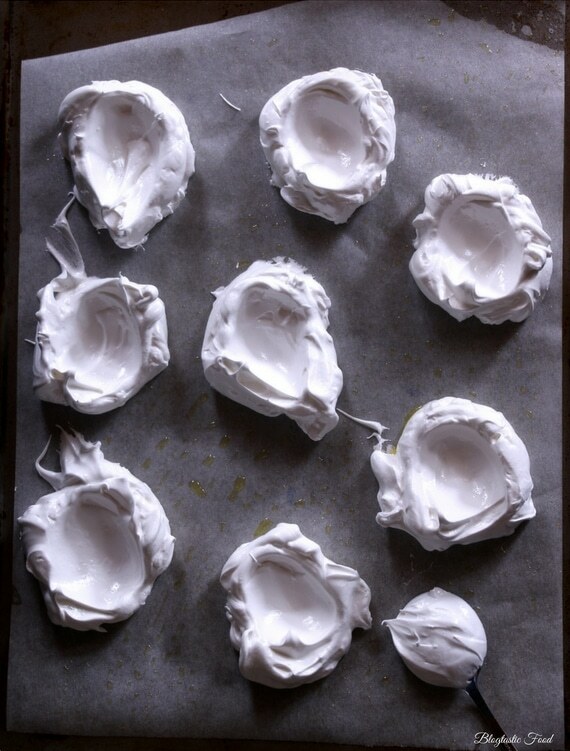 Carefully lift the meringues off the baking tray and transfer them onto a plate or board then set aside. Put the vanilla extract and the cream together in a bowl. Whisk the cream until it is thick, holding it's shape but it is still nice and smooth. Set aside. Add the Strawberries, sugar and lemon in a food processor and blitz until nice and smooth. Transfer to a bowl then set aside. 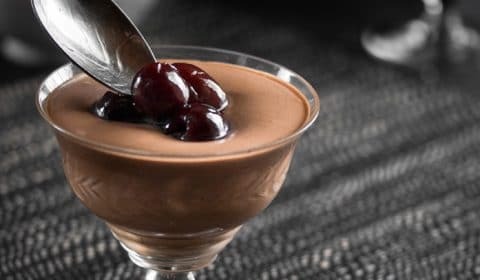 For anyone who only has a hand blender, you could just hand blend those 3 ingredients in a bowl and you'll get the same result. Use your hands to mould and rub the food colouring through the fondant icing (use gloves if you're scared to get messy but hey, it's Halloween you're supposed to get messy). When you're done put it in the fridge. Scoop the vanilla cream into a piping bag, then pipe the cream into the meringue moulds. Or you can spoon the mixture in. Place in the fridge. Take the fondant out of the fridge, line a flat, clean surface with greaseproof paper, lightly dust the greaseproof paper and a rolling in with icing sugar. Start rolling out your dark fondant icing until it is nice and flattened out. From there you can use a small knife to cut out whatever Halloween shapes you want. You can now decorate your pavlovas with your fondant icing then return to the fridge. 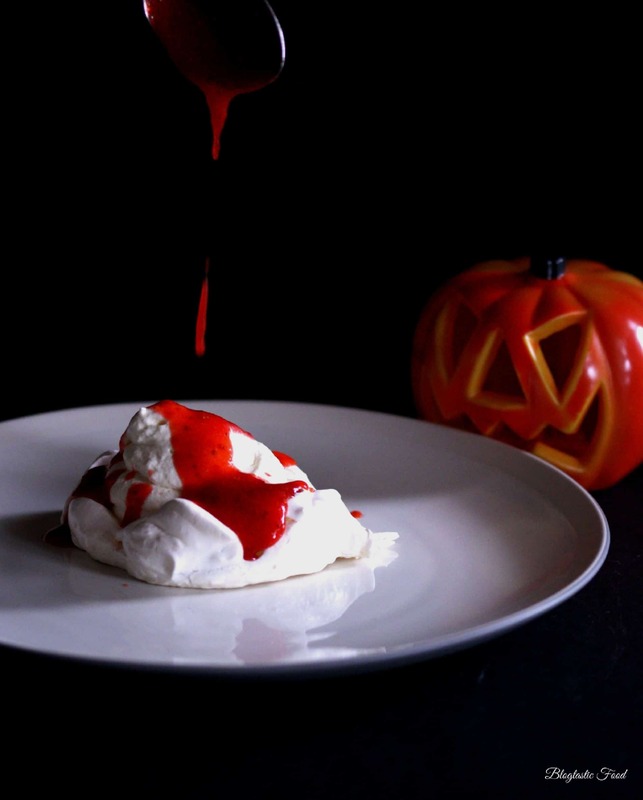 Do not drizzle the coulis (your bloody strawberry mixture) over the pavlovas until you are about to eat/serve them. Otherwise, your meringues will go soggy. Don't forget that the key to a good meringue is to cook them low and slow in the oven, then giving them time to cool down.